Here is item 2 in my quest to create some cute organizational items for my desk. This is the mini magazine holder. I'm sure you've seen it before. I did one a while back using a piece of 8 1/2 x 11 sheet of card stock HERE that will hold A2 cards. I also have a pattern for a holder of A2 cards that used 12 x 12 sheet of cardstock. When I purchased the kit from Inking Idaho it was the 12 x 12 patter that was included in the instructions. I've had the 12 x 12 patter for sometime that I found off of a blog. I'm still searching for it so if I find it I'll post a link so you can create one yourself. The construction of this holder is quite simple really. It's just three of the mini magazine holders taped together. I used sticky strip of course. Then just add a few panels of CS and DSP to the front and sides. It's a snap. Literally the hardest part was getting each piece lined up with each other. You know that sticky strip..once it's down..it's down. I'll have another cute accessory to add to this set tomorrow so stay tuned. Wow, this is really awesome. I love it, the colors are great together too. this came out so wonderful! I love how you added to the organizer drawers below! I love this. what a great gift to give or just to make your crafting area so much more organized! I may just have to try this out! thanks for the inspiration! Very cute!! This is a great organizer and it will make your desk look very pretty! 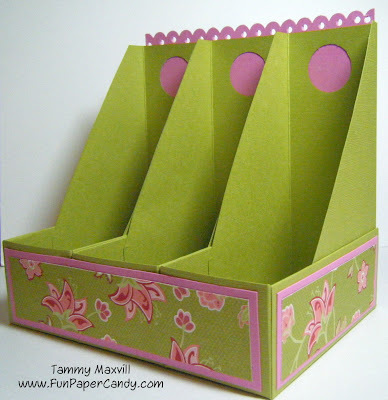 Tammy this organizer set is coming out so awesome! Are you going to keep it or give it away? It would be really hard for me to give this one away, lol! I love the colors that you chose and can't wait to see what you make tomorrow. TFS! This turned out great Tammy!! Love that you are able to organize, I am in the process of organizing and oh, it takes forever. Guess I read these out of order. Here's the piece I love - the mini magazine organizer. How cute & functional! I might have to give this a try! Wow...these are lovely...love the papers you have used.